Offices are often the heart of business. A consequence of this is a “non-stop” flux, and much-needed renovation tends to be continually pushed aside – as it would be too inconvenient in the short-term. As a result, grime, dust, and mildew are allowed to creep into the office space unabated, posing potential health risks. The carpets and wallpaper can start to fade and come away from the wall, an unappealing aesthetic that can even reduce productivity. Dirt Busters offer a specialist cleaning service to renovate and restore any offices that require them. Our portfolio is extensive and no industry is beyond our ambitions, stretching from typical business offices to hospitals, clinics, auditoriums, and car dealership offices. No operation is too big for us either: we have serviced commercial buildings, industrial facilities; even construction sites, all to the delight of our customers. Carpets: replacing a carpet is an enormous job, and it’s not surprising to discover some are more than a decade old. The result is a common and unsightly fade, contrasted with dirt, mud, and a few permanent footprints – as though they’re apart of the pattern itself. It is possible to restore lustre to an old carpet without replacing it, however. We use a variety of foam and liquid solutions to shampoo and leave it smelling brand new. Windows: our technologies reach all the difficult places without risk of injury, getting rid of unsightly smudges in the process. 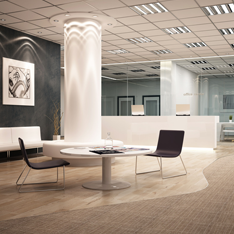 Floors: beautiful flooring, like carpet, says a lot about what you think of your business. We have the tools to clean anything from marble, vinyl, limestone, hardwood, or ceramic floors, and the grout in-between. Dust: this health hazard likes to accumulate on shelves or hard to reach places, but can generally settle on keyboards and monitor screens. Dust is a mixed-bag of dead skin, flea and mite eggs, and harmful bacteria. Consider it gone. The break and restrooms: After the office space, these are the two areas most likely in need of a deep clean. After we’ve removed the typical food detritus and harmful bacteria from surfaces, we’ll give the microwaves, refrigerators, coffee machine – even the dishes on the way out, so everything’s spick and span for lunchtime. Thanks to greater health and safety awareness, there are less office fires than ever before, but it can still happen, and the aftermath can be devastating. If you’ve suffered from a fire in the workplace, we can get you on the road to recovery. We have the extensive training and experience to handle hazardous chemicals, for risk assessment, to adhere to the necessary safety procedures and regulations during the clean up, and to get right to work restoring your business. Why Choose Dirt Busters for Office Cleaning Services? With years of experience and knowledge in the field, nothing is too difficult to clean for us! Our team comprises professional cleaners with a keen eye for details. Leave the heavy lifting to us and never worry about the cleanliness of your office ever again. Rely on our office cleaning services in North East and you will receive trustworthy, immaculate results. Dirt Busters offers dozens of customers the peace of mind that they can go the office every day and find a clean environment where they can focus on work and be productive. We respect your unique demands, your schedule and your budget. We know that your facility might have specific requirements. This is why we emphasize communication and are always open to discussing even the smallest details. We enjoy going above and beyond for our clients – that is why we will create a customized, professional cleaning program that takes into account the space, your needs, schedule and budget. Dirt Busters boasts time-efficient and consistent office cleaning services that won’t fail to impress you. Our traditional office cleaning checklist included vacuuming, disinfecting, mopping, dusting and trash removal. This ensures the workplace is disinfected, germ-free and spotless, ready to receive employees and visitors in a tidy, safe environment. Allow us to help you make a great first impression with customers, potential business partners and new employees! Are you ready for a cleaner office? Offer your employees and customers in North East a healthy work environment and turn to the team at Dirt Busters. Drop us a line or call us today. Whether you have inquiries or would like to book our services, we will be happy to hear from you and provide you with any additional details you might need.